Happy Sunday! 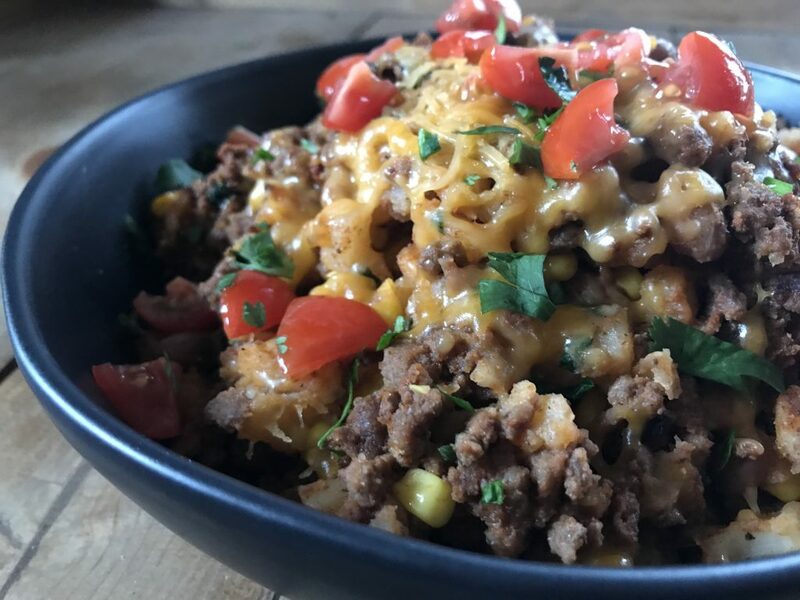 Introducing: Cowboy’s Meal. 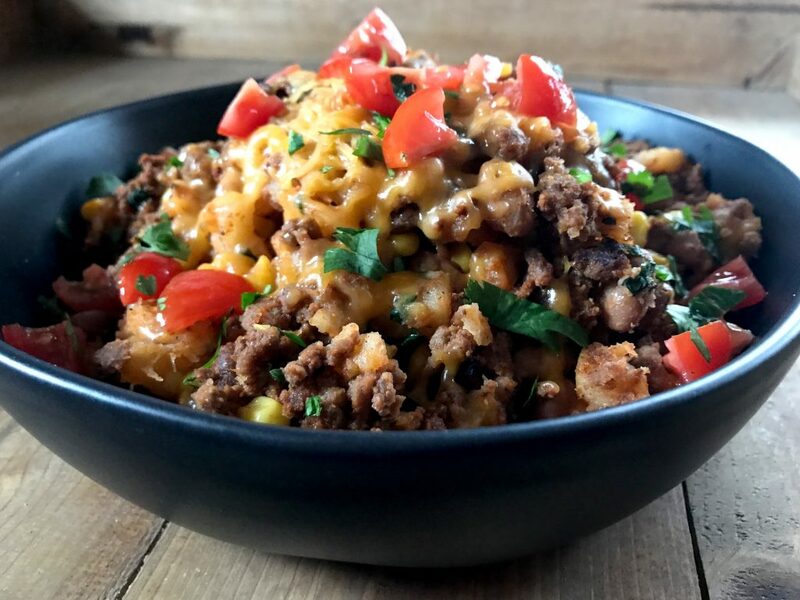 A hodge podge meal made up of the most satisfying ingredients with a delicious Tex-Mex vibe. Alright, here’s a story for ya. On the very last day of 2017 my mama took little Pepper for Eric and I to spend a night together without a toddler. The downside of that? The temps were in the negatives and it was just all around unpleasant. We had dinner plans out, but instead opted to rent a bunch of movies, make dinner at home, and eat a bunch of stove top popcorn and starbursts. That’s actually my favorite kind of night and to be honest, the perfect way to end such a great year. I wanted to make something different because well, it was New Year’s Eve and all, but I didn’t feel like spending a ton of time in the kitchen because there were movies and popcorn and starburst waiting for me in the living room, you know? So, what’s probably the quickest and easiest meal that I have in my repertoire and that I always have the ingredients on hand for? You guessed it. Poor Man’s Meal! 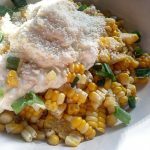 It’s one of my favorite meals and it’s very popular on this ol’ blog! You can read all about it, how much I love it, how I grew up on it, and grab the recipe here. I still wanted to make something a little different so I decided to just start throwing a bunch of stuff together. I was feelin’ a southwest vibe and seriously, the end result equalled magic. 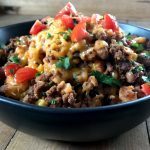 I had a hard time with a name for it at first, but I’ve finally decided on Cowboy’s Meal! I don’t know any cowboys personally, but I do know that they seem to like things like beef, beans, corn, and a lil spice. This was the PERFECT meal to end 2017 with for Eric and I. It was hearty enough for the cold winter’s night we were having, it was just spicy enough, it was simple, and most importantly, it was delicious! 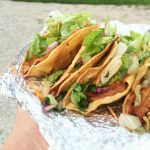 We ended up loading up the meat/potato/bean mixture into flour tortillas and piling tomatoes, cheese, and lettuce on those. Y’all… make this and then, do that. 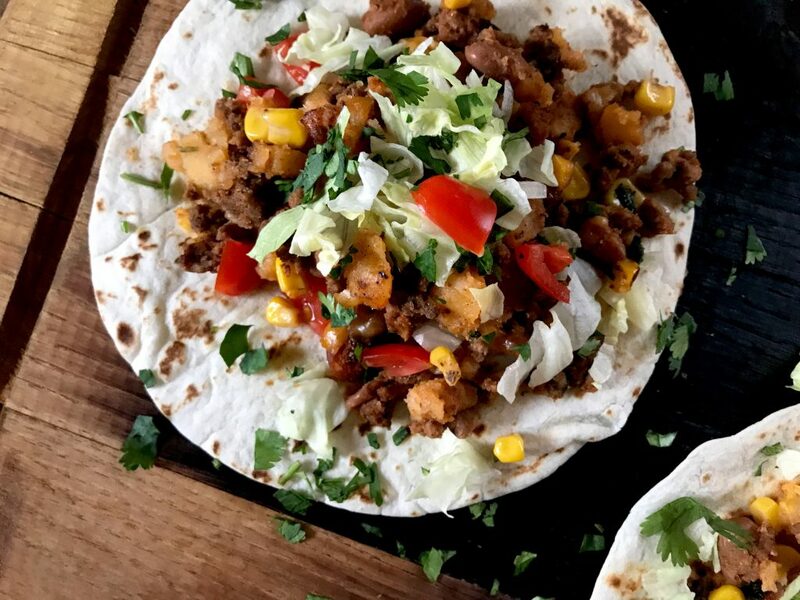 It’s delicious on it’s own, but add it to a tortilla blow your own dang mind. 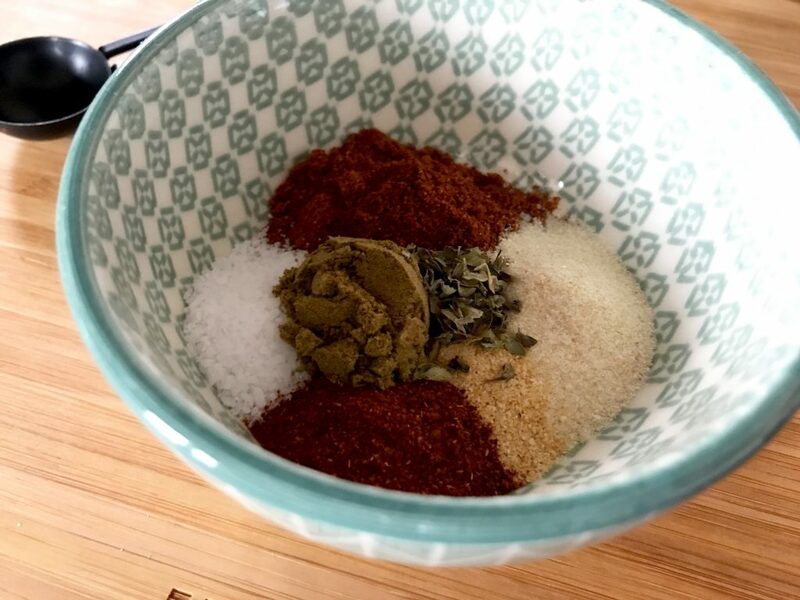 Now, let’s get down to business in the kitchen..
You’re going to start off with a adding a bunch of spices to small bowl. I know it seems like a lot, but trust me, you need all these spices to make it perfect. 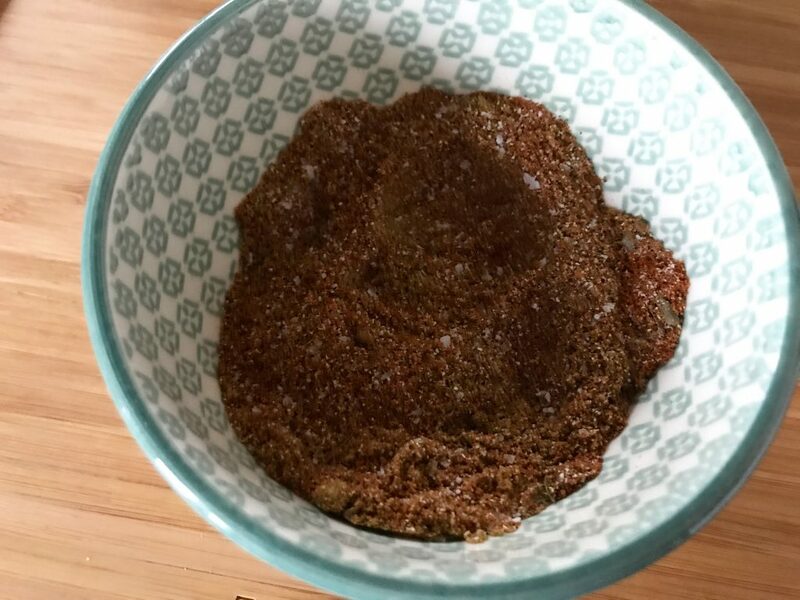 Grab 2 teaspoons chili powder, 2 1/2 teaspoons cumin, 1 teaspoon paprika, 1/4 teaspoon cayenne pepper, 1/2 teaspoon oregano, 1 teaspoon onion powder, 1/2 teaspoon garlic powder, and finally, 1 teaspoon kosher salt. Be sure to keep the garlic powder and kosher salt out. You’ll need a teaspoon of each later for the potatoes. 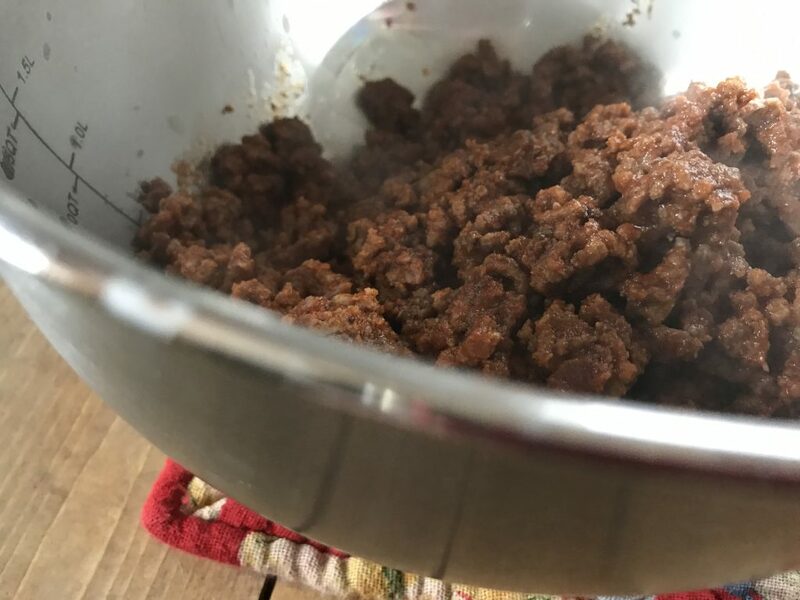 In a large hot skillet add one pound lean ground beef. Break up with spatula very finely. Add seasoning mixture to beef when it’s browned. Let it cook for 1-2 minutes all together. Now, add a small 8 ounce can of tomato sauce to the meet and stir it in well. Cook for another 4-5 minutes together, stirring occasionally. Remove meat from skillet and set aside. 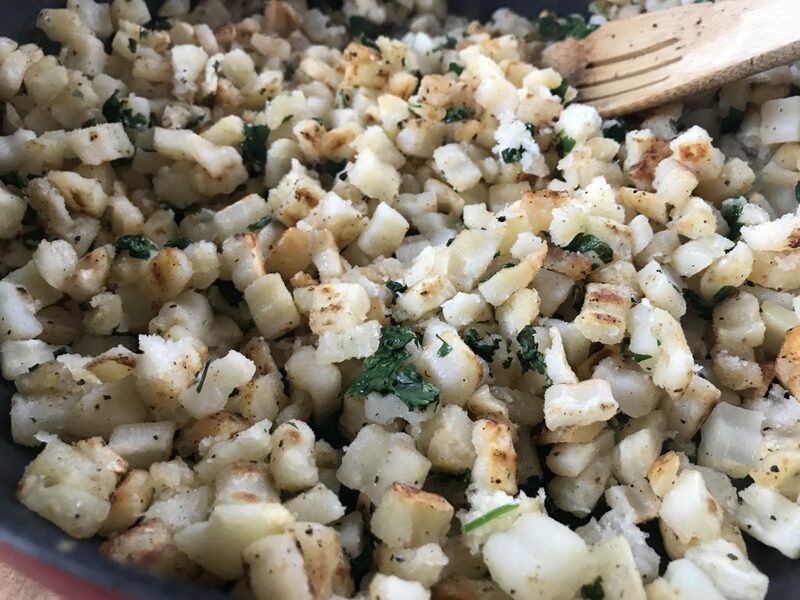 In same skillet, (no need to wipe it out) Add 3 tablespoons of vegetable oil and then 6 cups of frozen hash brown potatoes. Season with 1 teaspoon salt, 1/2 teaspoon pepper, and about 1 teaspoon garlic powder. Continue to cook over medium-high heat until the potatoes are warm and lightly browned. If you need to spray the potatoes with a bit of cooking spray. Stir it in the last few minutes of cooking time. Gently stir them into the potatoes and cook all together for just a minute or two. GENTLY fold the beef into the skillet. The potatoes are a bit delicate and can mush up. It doesn’t really matter to me, but if you care. Be gentle. Seriously… my stomach is growling because I am sitting here looking at these photos. Okay, if you want to take this dish to NEXT level delicious. Heat some tortillas up. I heat mine over the burner for about 30ish seconds on each side. You can heat them this way, in the oven, or the microwave. Whatever you are used to! 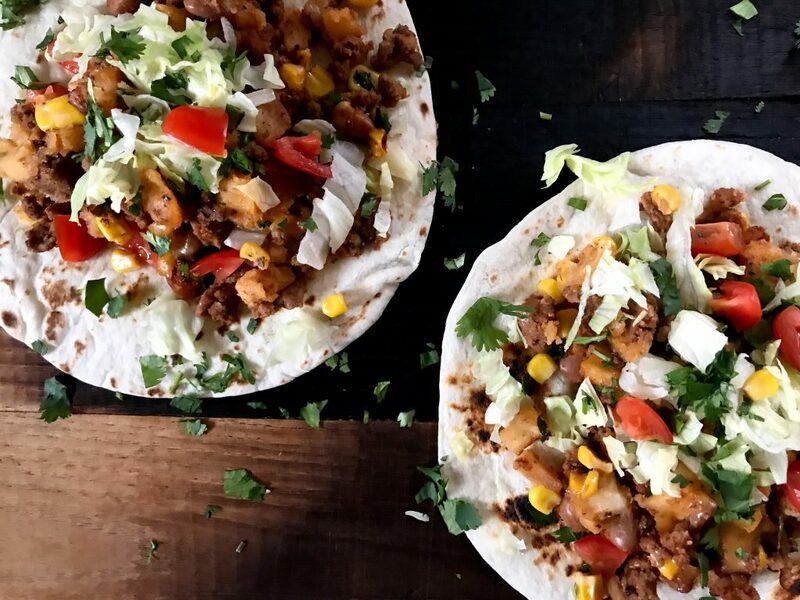 You can also use corn tortillas. 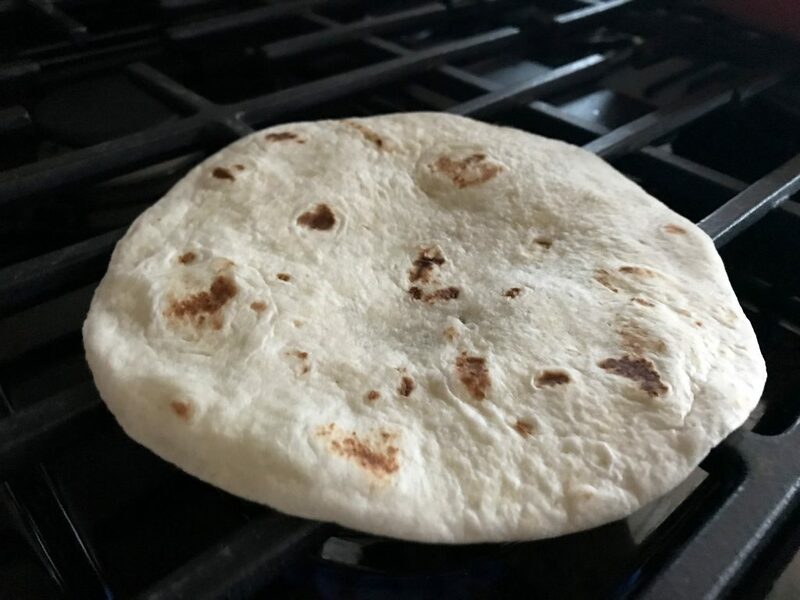 Flour tortillas just hold a special place in my heart. aaaaand, plop some of the mixture on the tortilla. Add some lettuce, tomatoes, cheese, extra cilantro, onions… whatever you want! I don’t think you could put the wrong thing on these, honestly. Okay, you could. 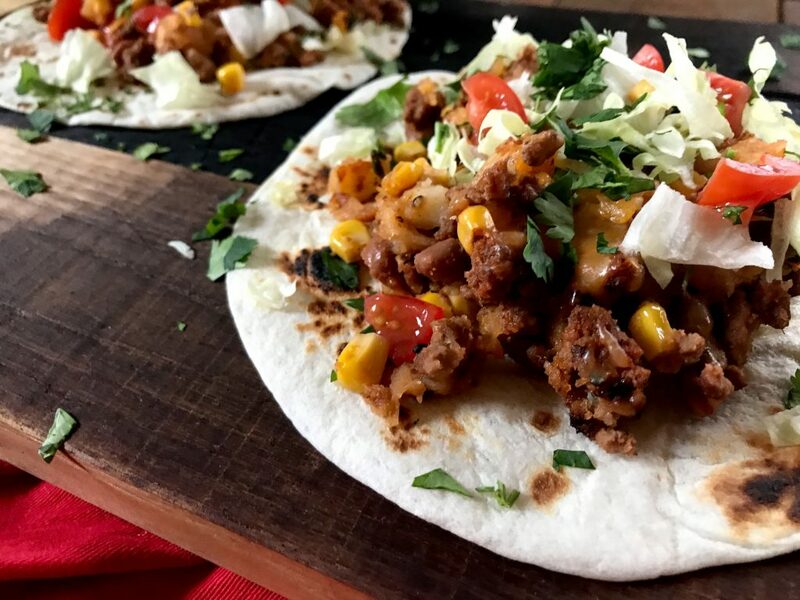 Stick to your favorite taco type toppings. 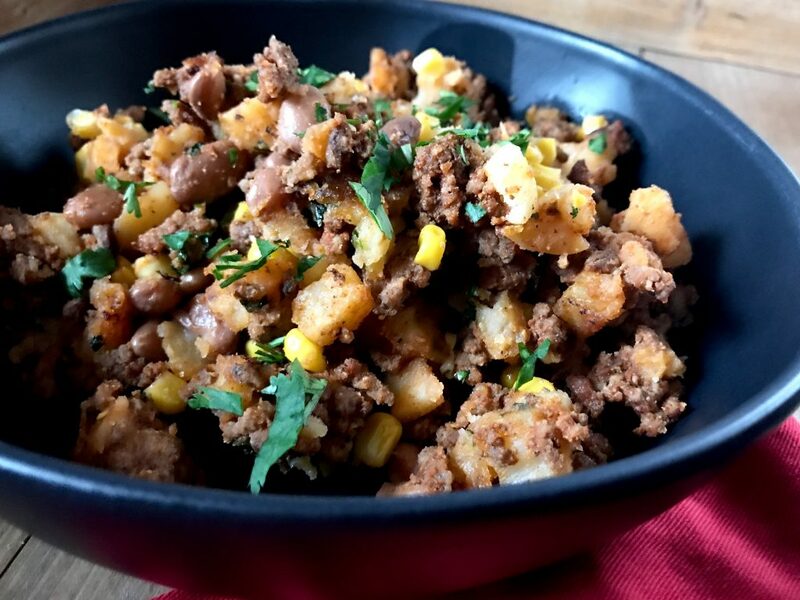 A lightened up skillet meal full of perfectly seasoned ground beef, potatoes, corn, and pinto beans. Stir together garlic powder, onion powder, oregano, cayenne pepper, paprika, cumin, and chili powder. Set aside. Make sure to keep 1 tsp garlic powder and kosher salt set aside for potatoes. 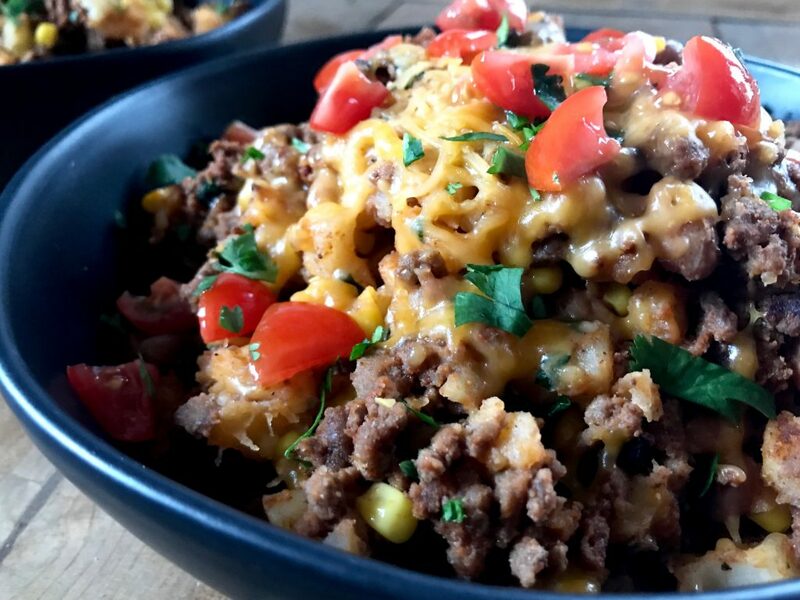 In a large hot skillet add ground beef and break up with spatula. When the beef is cooked. Add spice mixture. Stir and cook together for about one minute. 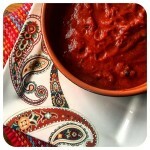 Stir in can of tomato sauce. Continue to cook over medium heat for a few minutes. 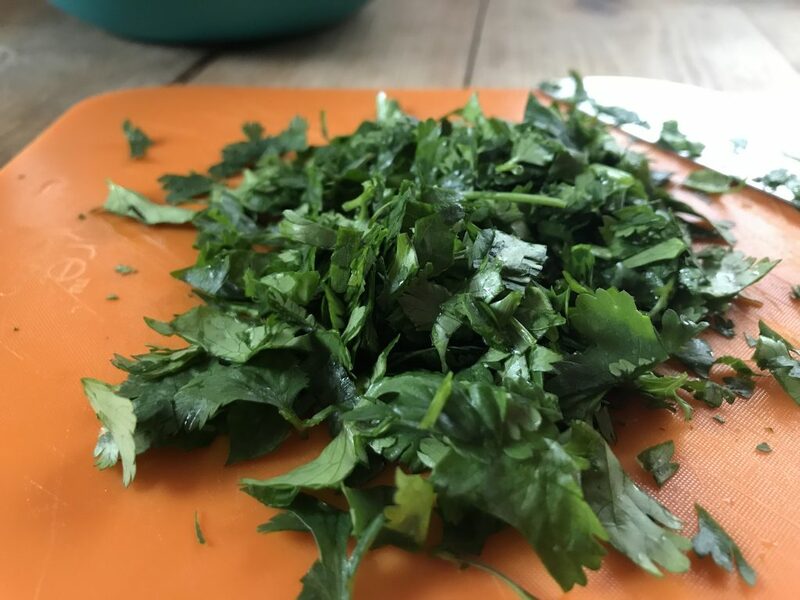 Remove from skillet and set aside in a bowl. 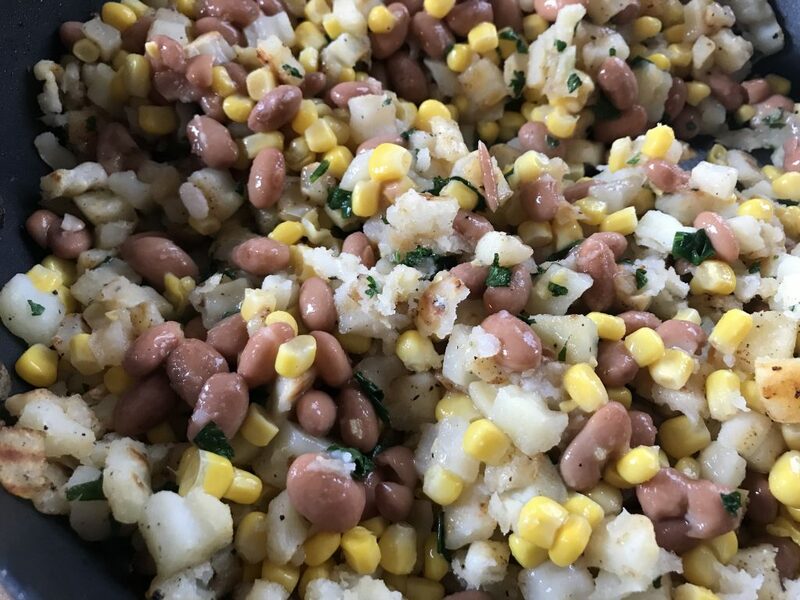 Add can of corn and pinto beans to potatoes. Gently stir the mixture together and cook for a few minutes. 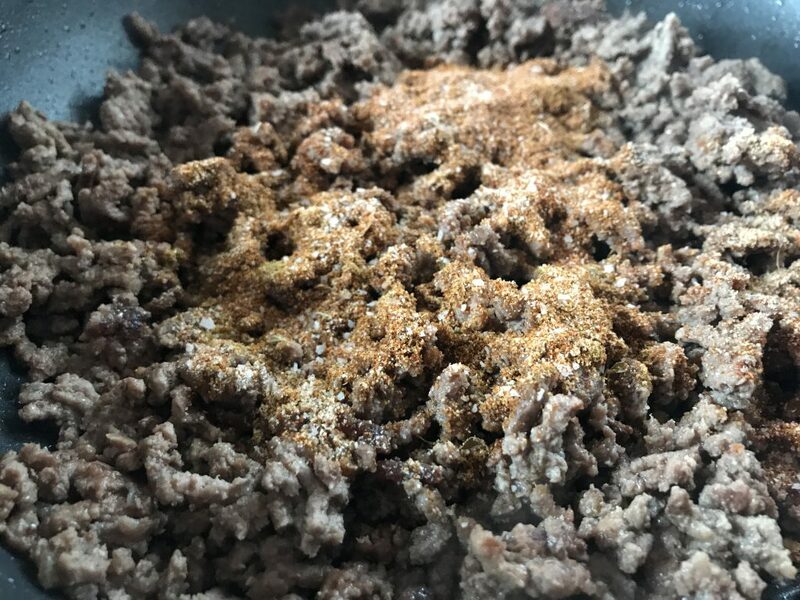 Add seasoned ground beef back into the skillet and gently stir into the mixture. 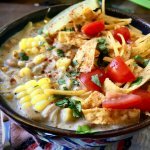 Serve hot in a bowl or on tortillas with extra toppings of choice! Enjoy! This was a great recipe! I used lean ground chicken instead of beef and it came out to 3 points! The flavor is so good! I’m going to use left over with tortillas to mix it up during the week!! 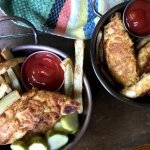 My 9 year old son loved it and didn’t even realize it was a healthy meal! He had seconds! Hi Stacy! SOOOOO happy you loved it and oh my gosh what a happy day when the kids love something too! Hi Claire, Thanks so much! This one freezes perfectly. WOW! This was such a hit in my house. I love the generous portions, I personally am such a chili lover, this was a fun twist. I used Simply Potato Southwest hash browns. So delicious. This was my first time making one of your recipes. Thanks so much! This looked good – I did not expect it to be as good as it was. Absolutely delicious! I’m going to be cooking this so much we get sick of it – ha! Haha! So happy you enjoyed it, Erin! I wonder if this would be good with riced cauliflower instead of hash browns? I haven’t tried it that way. Let me know how it goes if you decide to give it a go! Hi, could I make this with regular potatoes (either yellow or red)? I have a bunch to use up! Would the recipe be the same? It should be just fine! They might take a little longer to cook that’s all. I am drooling! 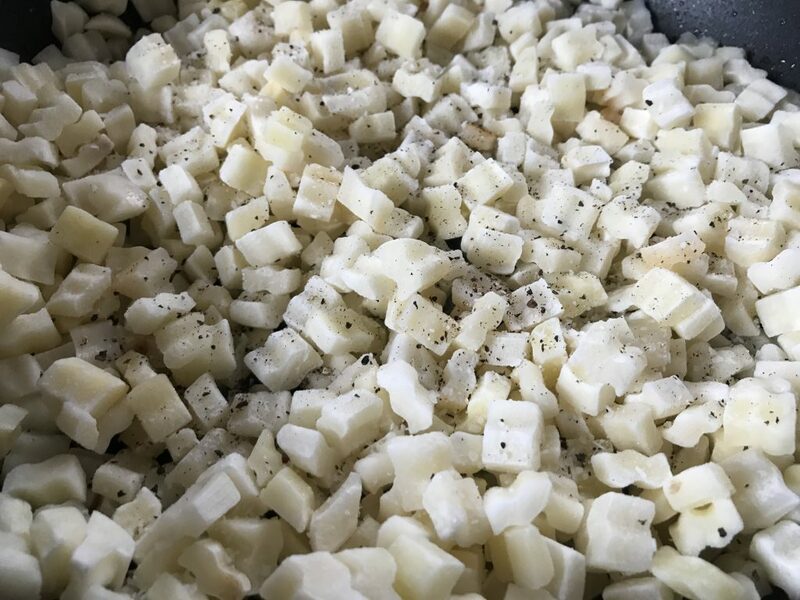 Can’t wait to try – quick question…Can you use diced white potatoes instead of frozen hashbrowns? For sure! They may take a little longer to cook, but it works perfectly. Soooo good!! I did cheat a little and reloaded the potatoes with a diced zucchini and yellow squash. Trying to watch the carbs . Threw in a few chopped jalapeños too. 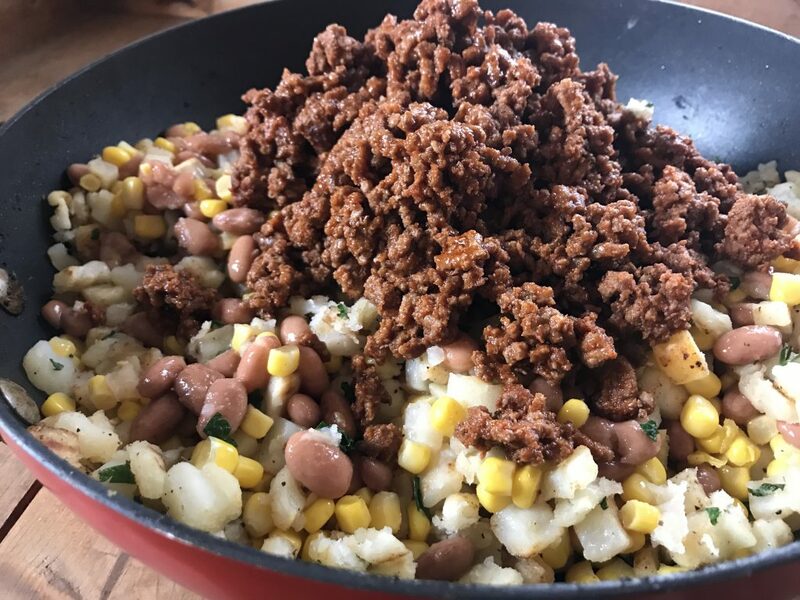 This is going on my meal prep list! Amazing! I’m sorry I don’t have a bag on hand right now so I can’t check that info, but honestly, as long as theirs no additional oils/sugars and just potatoes, maybe salt & pepper then the points should be the exact same. I’ve also used shredded in place of the cubed. I hope that helps, and hope you enjoy! That’s what I thought. Unfortunately the two bags I looked at had 4g and 8g of fat. I will have to keep looking! 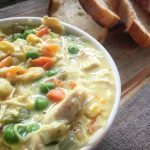 My family, 3 kids included, loved this recipe and have asked when we can have it again! It will definitely be in our regular rotation. Thank you! Hi! 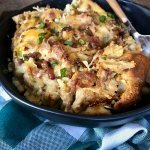 Planning on making this tomorrow night and my grocery store only had the shredded hash brown potatoes- do you think it makes a difference? Just wondering if I absolutely need to go to another store to pick up diced hash brown potatoes. Thanks! It should work just fine for ya. Hope you enjoy! Thanks!! Looking forward to it! I am so happy to hear you enjoyed, Gabby!! Let me know what else ya try! I am really looking forward to adding this to the menu for next week. I saw when you first published it and I didn’t read the recipe closely and thought that I would need to dice up raw potatoes so dismissed it. Glad I took another look. I was having the same issue as some of the other folks regarding calculating points. My first issue was that I plugged the ground beef into the calculator accidentally selecting “cooked” instead of raw. The other issue that I found was with the hash brown potatoes. When I specified “Ore Ida” brand hash browns, I got the same 5 points per serving. When I used generic frozen hash browns, the point value for the recipe was 7 points per serving. Hope this info helps out some other folks. I made this last night and it was really good! I measured out 6 cups of diced hash browns but it looks like so much… Like way more than 8 servings. Do you usually use an entire 32 oz. bag of hash browns? Idk it just looks like it turned out more although 6 cups of hash browns is a lot. I’m so happy you enjoyed! Yep, I use 6 cups of frozen hash browns. 6 cups of the hash browns is not a 32 oz bag though. And yep, it’s 8 servings (1.25 cups each) I’m kind of confused on what you’re asking exactly, so if I didn’t answer your question please let me know! I guess my question is, I had a 32 oz bag of hash browns and measured out 6 cups of it and it almost used the whole bag. Is this normal? I’m not a pinto bean lover so going to use black beans in this recipe, that will work too right? It’ll totally work!! I am so happy you enjoyed the Biscuit Bake! I’m making it with ground chicken breast and making the frozen hash browns in the Acti fry with 1 tbsp of oil. So 4 SP points. 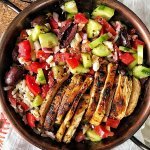 I’m excited to make this for dinner this week! Have you tried freezing this to save some leftovers? I have not, but I don’t think it would be a problem! Made this tonight and it’s amazing! Even my husband loved it. This will be a staple in our home. Thanks for such amazing recipies!! You’re welcome. I am so happy you’re enjoying them!! Just made this tonight & absolutely delicious! Definitely will be making again. SO happy you enjoyed it, Bev! I’m so happy you and your family enjoyed. Gina! Thanks so much for letting me know and rating the recipe! I add all the info as you have it posted, and get 8 points every time? I am doing it with the WW calculator and using your exact numbers. I can’t figure out how you’re getting 5? I don’t want to be negative, but I really want to be accurate. are you entering lean ground beef, raw- 1 lb ? I started WW about a month ago. Your recipes have have been SO helpful! I love to cook and it’s great to feel like I don’t need to give that up to lose weight. I’m going to make this tonight. This recipe is a keeper, everyone loved it! Thank you! Bake your hash browns in the oven to get them cooked and then you don’t need the added oil. Love your recipes. I had the same issue as Janet, when I entered the recipe and Weight Watchers app I get 8sp? I double-checked ingredient by ingredient to make sure that I didn’t miss something or add too much of something and not sure why I’m getting eight SP? I’m not sure either. I’ve double checked a couple times now and it’s coming up as 5 Points on my end. 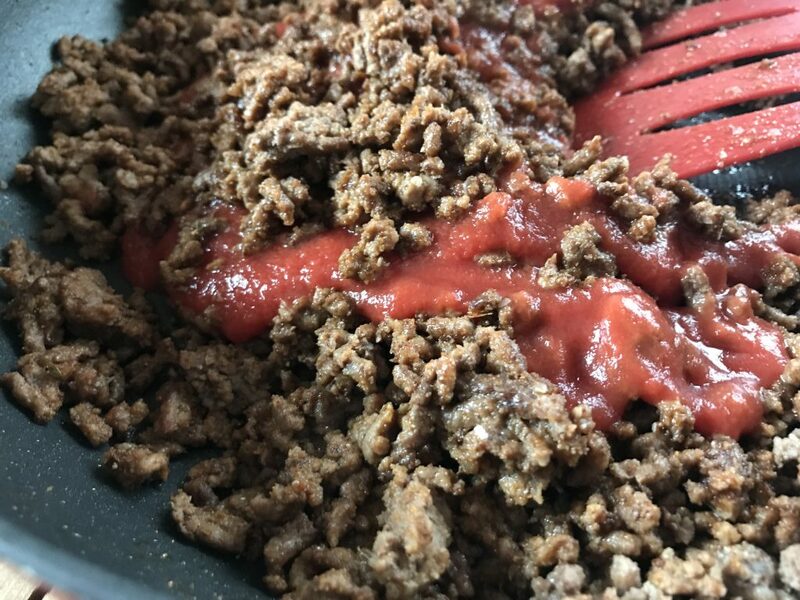 Are you entering the ground beef lean 1 lb raw? that’s the only thing I could guess that could be mixed up. DELICIOUS!!! We made this last weekend and my teenager could not get enough of it. He had it for dinner, breakfast the next morning and a snack in the afternoon! I was hoping for leftovers myself :(. Plus he told everyone we saw over the weekend about it! This will definitely go into our rotation! Thanks for all the great recipes. I wouldn’t recommend using the 99% lean ground turkey in this recipe. It doesn’t taste right. However it would still taste good with 93% lean ground turkey! What brand of frozen hash brown potatoes do you use? Is 6 cups one bag? This is the third recipe that I’ve tried from your blog and I absolutely love it!! 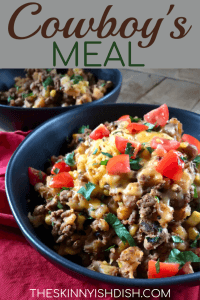 My husband is naturally thin so it’s always been tough for me to be “dieting” while he eats whatever he wants, your recipes are so yummy that we are both eating the same meals and it doesn’t feel like I am being deprived while I am sticking to my points! Thank you! I completely understand where you are coming from! I’m so happy you guys are able to eat and enjoy the same meals now! 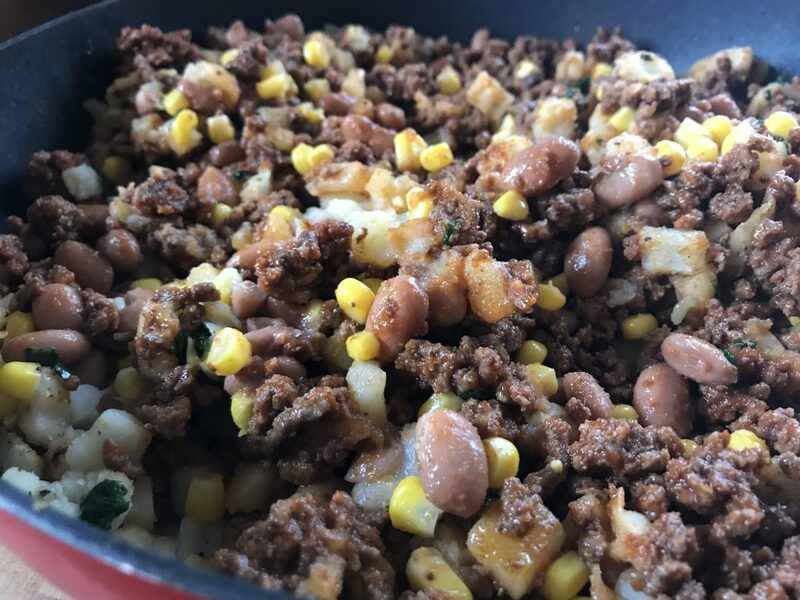 Made this tonight and it’s a new family favorite! Soooo good! And such a big serving for only 5 Freestyle points. Yay!! 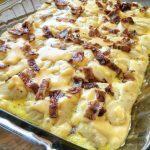 I love your recipes and appreciate ypu.updating everything to reflect the Freestyle program. I calculated the cowboy meal and it comes up as 8SP. It wpuld be 5 Freestyle SP if extra.lean ground Turkey is used. I’m sorry, but I think you might be calculating something wrong. It is 5 points, I just double checked. 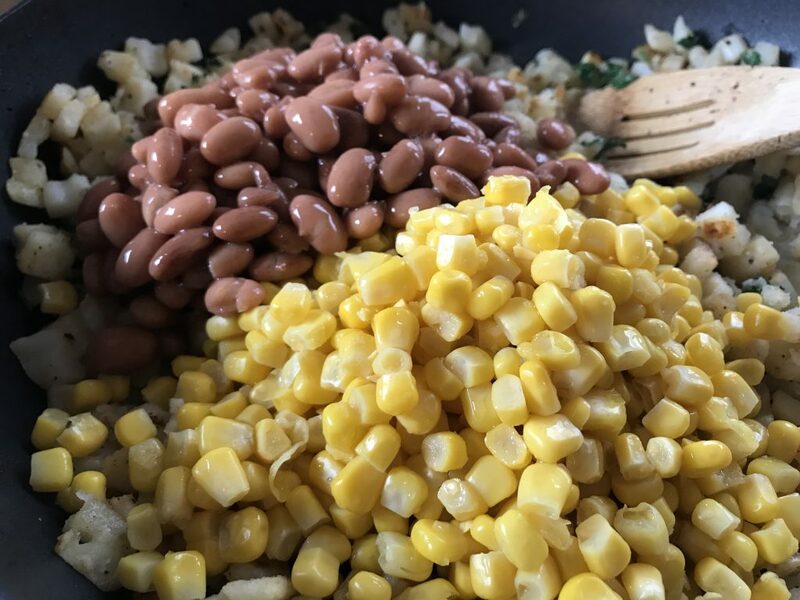 If you used the nutritional info to calculate it will not match up because the beans and corn are included in the nutritional information. 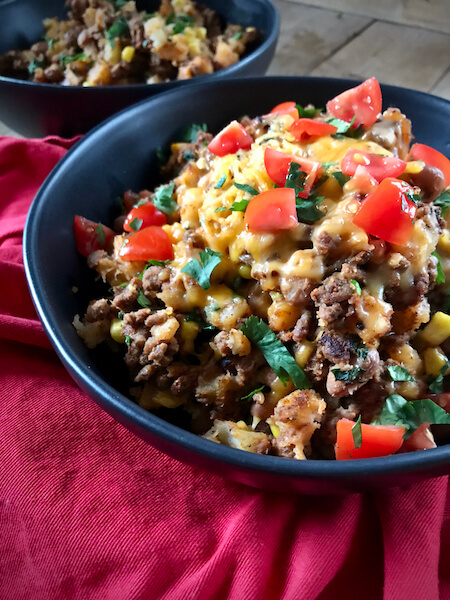 I get 7 freestyle points using the recipe builder, 12 for ground beef, 12 for oil, and 29 for hash browns divided by 8 servings is 6.6 points per serving….but I’m going to make it this weekend! 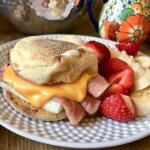 I use the Weight Watchers Recipe Builder to calculate the recipes. Different brands of ingredients may affect points though. Hope you love it! Yes, I used that too. I got 5 originally, but had forgotten to add the oil…Looking forward to it for next weeks meals! Thanks!